An anthology of new PMC and PSC scholarship edited by Thomas Jäger and Gerhard Kümmel. Some of the chapter included incorporated ground-breaking research and ideas. This is an excellent collection of essays by scholars from around the globe and the volume has become essential reading for those interested in the evolution of this fascinating topic. Private military and security companies (PMSCs) have become a distinct and increasingly relevant phenomenon in defense and security politics. They can be used in different settings and situations and constitute adequate tools for their various clients. Yet, there is an intense debate about them since they may and do generate specific problems, including severe violations of democratic norms and human rights codices. 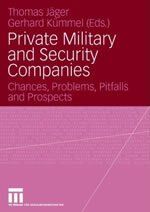 The present collection of contributions to this topic by distinct experts in the field is unique as it covers most, if not all aspects involved in the use of private military and security companies. As such this anthology serves the interests of both the layman in the field who may read this book as a thorough and encompassing introduction to the field as well as those of the specialist - be it a politician, a journalist, a defense/security practitioner, a student or an academic - who will find new information and genuine, and sometimes even provocative, ideas.